Back in my early days of seminary, during the first weeks of class, our professor introduced our class to a concept he called “deconstruction.” The idea was to “de-construct” (not destroy) everything we had learn or been taught theologically in order to analyze and verify it. He said this was necessary because most of the beliefs we had adopted, we had accepted them without giving them any serious critical thought. In other words, we had accepted what we have been told as truth without doing any research or investigation to verify the validity of it. The goal of deconstruction was not just to tear down our “pop-theology” (the professor’s term for theology we had formed from what we were told and not from serious biblical study) but to analyze, investigate, and verify it. Within that process, ideas thought to be true but after serious study, found not to be, were discarded and ideas that were found to be true were strengthened and expanded, along with the adoption of new concepts and truths acquired through serious biblical and theological study. First of all, by definition, home is the place of origin. Home is where you come from. So the question that begs to be asked is: Did we come from Heaven? According to the biblical text, we didn’t! Genesis 2:7 says: “And the LORD God formed man of the dust of the ground, and breathed into his nostrils the breath of life; and man became a living soul.” (KJV) The text suggests that man in his origin was a combination of the earthly (the dust of the ground) and the divine (the God-given breath or spirit <the particular Hebrew word in this text that is translated as “breath” is neshamah, which can be translated as “breath” and/or “spirit.”>). Man is a combination of Heaven and Earth, but man didn’t come from Heaven! Man’s origin is the earth! In fact, the whole Creation story seems to suggest that earth was created for man’s habitation and dominion! By the way, when Adam and Eve fell in the Fall, they didn’t fall “from Heaven!” They didn’t lose Heaven; they lost dominion! We can also define home as the place of residence or the final destination. Using that definition, let’s see if Heaven is indeed home. Is Heaven our ultimate place of residence or our final destination? Again, I would like to suggest that although we commonly think so, the Bible really says otherwise! Genesis 1:26-28 says: “And God said, Let us make man in our image, after our likeness: and let them have dominion over the fish of the sea, and over the fowl of the air, and over the cattle, and over all the earth, and over every creeping thing that creepeth upon the earth. So God created man in his own image, in the image of God created he him; male and female created he them. And God blessed them, and God said unto them, Be fruitful, and multiply, and replenish the earth, and subdue it: and have dominion over the fish of the sea, and over the fowl of the air, and over every living thing that moveth upon the earth.” (KJV) Clearly, man (male and female) was made to have dominion over the earth. Also remember, at this point in the text, sin had not yet entered into the world, so this would constitute God’s original intent. God’s original intent was for man to have dominion over the earth! Psalm 115:16 says: “The heaven, even the heavens, are the LORD’S: but the earth hath he given to the children of men.” (KJV) Heaven is God’s home; not ours! And speaking of God’s original intent; it was not God’s original intent for man to die! Death came as a consequence of sin! The only way we can get to Heaven now is by dying! And according to the Bible, death is not extinction; death is separation. Physical death is the separation of the soul/spirit from the body. So when the believer dies, the body is left on earth and only the soul/spirit goes to God. Now, stay with me here! God created us originally to live on earth in a body. We were created as a union of spirit and body. Therefore, when we die and our soul/spirit goes to Heaven, not only are we not at home, but in a sense we are also incomplete! The Bible says that Heaven is a place, but it is a spiritual place. In other words, as Paul says in I Corinthians 15:50: “Flesh and blood cannot inherit the Kingdom of God.” Our bodies cannot and do not go to Heaven, only our spirit/soul. When we go to Heaven, part of us is left behind! Now, God doesn’t just discard the body and forget about it. You see, if Heaven was home, there would be no need for the resurrection! But there will be a resurrection (a reunion of the spirit/soul with the body)! Even the Old Testament Patriarch Job said: “For I know that my redeemer liveth, and that he shall stand at the latter day upon the earth: And though after my skin worms destroy this body, yet in my flesh shall I see God.” (Job 19:25-26 KJV) Now, let me ask you this: If Heaven is a spiritual state and Heaven is our final destination, why go through the trouble of having a resurrection? Now some would answer at this point: “So that we might be judged in our bodies for what we did in our bodies.” But couldn’t God just as well judge us in spirit without our bodies? I would like to suggest that the purpose of the resurrection is not primarily for judgment! God has something even greater in mind! Let’s look at a few “resurrection” texts for some further insights. Now, we usually look at I Thessalonians 4:13-18 as a proof text for the “rapture” but it also sheds some interesting light on the resurrection. Verse 14 says: “For if we believe that Jesus died and rose again, even so them also which sleep in Jesus will God bring with him.” (KJV) Paul says that when Jesus comes, he will bring with him the spirits of those believers who had already died. Question: If Heaven is home, why bring the spirits with him when he comes back to earth? Why couldn’t he just say to them: “Wait here (in Heaven) while I go down and get the rest!” But he will bring their spirits with him! Why? Verse 16 gives us the answer: “For the Lord himself shall descend from heaven with a shout, with the voice of the archangel, and with the trump of God: and the dead in Christ shall rise first.” (KJV) Wait a minute! Aren’t “those who sleep in Jesus” (the ones he will bring back with him) and “the dead in Christ” the same people? What’s going on here? It’s the resurrection! Jesus will bring back with him the spirits/souls from Heaven and their bodies will be raised from the graves so that body and soul might be reunited! Paul concludes by saying in verse 17, “and so shall we ever be with the Lord.” (KJV) But wait a minute! Why would we need our bodies (even if they are glorified) if we are going to spent eternity in Heaven where we won’t need them? Because we are not going to spend eternity in a disembodied state in Heaven, but we will need bodies for where we will spend eternity! Let me now conclude by lifting up the words of the Apostle John in Revelation 21:1-5 for us to ponder in regard to our question. John said: “And I saw a new heaven and a new earth: for the first heaven and the first earth were passed away; and there was no more sea. And I John saw the holy city, new Jerusalem, coming down from God out of heaven, prepared as a bride adorned for her husband. And I heard a great voice out of heaven saying, Behold, the tabernacle of God is with men, and he will dwell with them, and they shall be his people, and God himself shall be with them, and be their God. And God shall wipe away all tears from their eyes; and there shall be no more death, neither sorrow, nor crying, neither shall there be any more pain: for the former things are passed away. And he that sat upon the throne said, Behold, I make all things new. 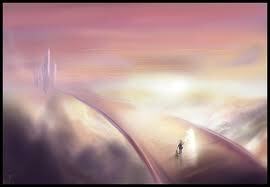 And he said unto me, Write: for these words are true and faithful.” (KJV) The first thing I want us to notice is that John said he saw the holy city, new Jerusalem “coming down from God out of heaven.” Where is it coming down to, John? Coming down to the “new earth” mentioned in verse 1! (By the way, a reference to a city can be a reference to not just the structures, but also to the inhabitants, here I think is a reference to the people of the city) Secondly, note in verse 3 that John said he heard a great voice out of heaven saying: “Behold the tabernacle of God is with men, he will dwell with them, and they shall be his people, and God himself shall be with them, and be their God.” Do you see that? Three times in one verse: God is “with men,” he will dwell “with them,” God himself shall be “with them!” We’ve always preached and taught that the ultimate goal is for us to go and be with God, but according to this text, the ultimate end is God coming to be with us! Your comments and critiques are welcomed! Tell me what you think! Is Heaven Home?